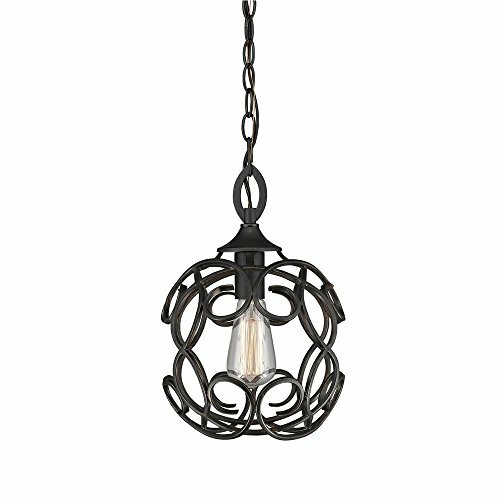 The small, spherical Golden Lighting Selene 2870-M1L ABZ Mini Pendant is graced with sweeping metal twists and a dark, hand-painted aged bronze finish with warm bronze highlights. This pendant light requires one 60-watt bulb, not included. Located in Tallahassee and founded in 1982, Golden Lighting is a premier provider and innovator of residential lighting design. With a wide collection of styles and types of lighting, the company continues to create new designs for today's homes. Dimensions: 9.75 diam. x 14H in. . Decorative aged bronze fixture. 1 mini pendant light. 72 inches of chain and 120 inches of wire included. Requires one 60-watt incandescent medium base bulb (not included).